Many of our tiles are in stock; however we may be low or out depending on the busy season. Orders are filled according to the studio schedule and in cue with all other orders. Feel free to contact us directly to ask for availability on any item. Please allow 3-6 weeks for shipping and receiving. Our tiles are designed and crafted with the utmost care. Each piece is hand-made and individually glazed. Although each tile is square, they all have minute differences in shape and thickness. 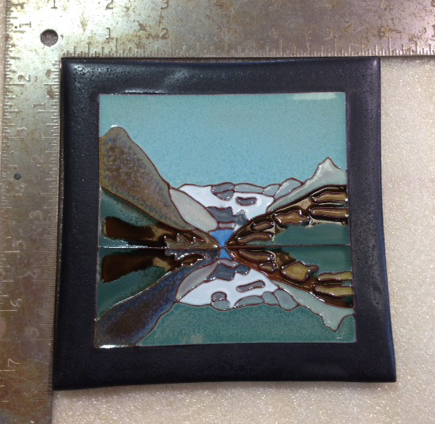 Our glazes are specifically calibrated to give a variation in depth of hue and surface to accentuate each design. These qualities are what make our tile unique and inherently beautiful. The size of our individual tiles are roughly 5.75" x 5.75" x .25" ( 14.5 cm x 14.5 cm x .8 cm), each weighs approximately 1.1 lbs. Each tile has a built in hanger, is stamped with our Voyager Art & Tile logo and is hand signed. If the tile is of a specific area like Landslide Lake, then we write the name on the back as well. The color on your computer monitor may not reflect the exact colors of the tile(s). Please contact us. We welcome custom orders, however, please be aware that there will be a design fee for initial development of the idea, drawings, mold making, glaze colors and prototypes. We're happy to talk with you about it. Our tiles are fired to a mature temperature for the clay body and are strong enough for being displayed decoratively in a stand, on a wall, or installed professionally into a kitchen or bathroom back splash. We are not responsible for problems that arise around installation or misuse. Please see "shipping" for broken tiles on arrival. Our online Squarespace system takes payment by Stripe. This system is well known and has a high level of security. We at Voyager Art & Tile Inc. will not share your information with anyone. The system we use in the Squarespace Shop asks for basic information so we can receive payment and ship our tiles to you. The site itself is under an encrypted code that keeps your information safe. Returns and refunds will be accepted only with prior approval from Voyager Art & Tile Inc. If we have shipped the wrong item or if by an unlikely chance that the tile arrived broken, then we are responsible for the return shipping costs. We will need to be notified right away as this could be a result of shipper negligence. If the buyer does not like the piece and would like a refund, then the buyer is responsible for all return shipping costs and proper double boxed packaging so the product returns safely with no damage before any refund can be issued. We use Canada Post for all our shipping within Canada. If you are outside of Canada, please contact us via e-mail for a shipping quote as prices vary along with customs and brokerage fees. If you have any questions about our terms, please feel to CONTACT US.